Some time ago, I fell in love with this cover. 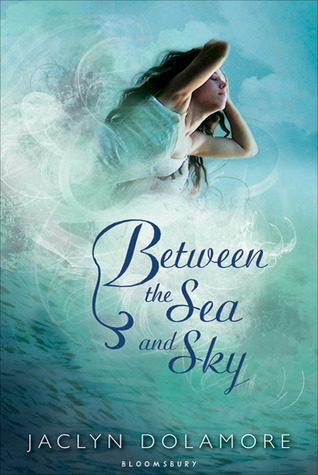 I was already a fan of Dolamore's from her debut, Magic Under Glass, and while I was eagerly searching Goodreads to see if/when I was going to get more stories about my darling little automaton, I came across this companion novel of a mermaid in love with a winged boy. And I thought, well isn't that just lovely? I mean, beyond the sheer obvious loveliness of the cover, isn't the idea of a love bridging these two contradictory worlds just lovely. [And every time I thought of it, the bit of dialogue from Ever After would pop into my head about "A bird may love a fish, signore, but where will they make their home?" "Well, we will have to give you wings!" would pop into my head...] So I put it on my wishlist and settled in for the long haul. Somewhere along the way, I had a little event with an awesome person, and got to chatting with Jaclyn Dolamore, who participated. Her lovely book that I was settled in waiting for got pushed back (because they were trying to torture us, I can only assume) - but I needn't have worried, because Jaclyn sent me a copy! Once the drooling was over, I convinced myself to wait to read it until closer to the publication, because I know myself and I know how I will put off writing a review until I've forgotten damn near everything I wanted to say. But eventually the time came, I was finally (finally!) able to sit down and read it. And I was right, it is lovely. I felt like there was a good struggle. Enough is built into the world-building and the situation to make you empathize with Esmerine and wonder what is the right decision for her, even while you're hoping she makes a certain one (because no matter what we say, we're all suckers for a happy ending). Esmerine's worries and her torn feelings seemed true to her character and situation; the way she has been raised and the way she, and those around her, have been taught to think and behave, contrasted with what she feels and what she wants made it a really enjoyable story. But beyond just Esmerine, we get snippets of other characters' struggles to be true to themselves and choose happiness. I loved the glimpses we get of Alan's struggles as the book goes on - I loved that his struggles came first, actually, long before Esmerine must come to terms with what she wants, and that he tried to be really brave about his lot in life, and kind of deadened himself in a way. And again with Dosia and her struggles, which we never actually get to know about until we see their effects - Dosia's selfishness was interesting. It was necessary in that reckless, careless way that you have to be sometimes for your own happiness, and she overcomes her struggles and goes for what she wants boldly (if thoughtlessly). There's this over-arching theme of sort of following your bliss, doing what's right for you and what will bring more happiness into the world. It's this great dimension to the story, which is told very simply but slyly layered with things like this. Another thing that I like, and this may seem silly, is that there's no real villain. I feel like, so many times villains are a crutch. Don't get me wrong, they can be great, and I love a good villain, but the fact is, that's not always life. There's not always an arch-nemesis, and doesn't need to be. This was a great example of that, because though there is some opposition in some respects, there is certainly no villain, nor even a need for one - the situational tension and misunderstandings are enough. The few things that bothered me were fairly minor, but worth noting. Foremost, it was very brief, which is something I actually like, but - But when something is so brief, I feel like there's no excuse not to flesh things out that need fleshing. You're not over your word count, you're not cutting things just to keep it from being mammoth. In short, you have the space, so there are times when I just felt like things could have been filled a bit more, could have been fleshed and finessed a bit more. The 2nd thing is just a product of having read an ARC - there were a lot of typos and some minor plot holes that just broke me out of the story occasionally. I would actually like to reread the book as a finished copy to get the "real" feel of it, once everything is smoothed and lovely, so I can read it without getting snarled in the errors. But this drawback is, in itself, actually a good thing - I wouldn't want to reread it as a finished copy if I didn't like the story. Ohhhh, I feel like I have entirely too few mermaid books on my radar and this one sounds particularly good! Glad this was enjoyable. It's on my top to read shelf now! YES YOU SHOULD! But even more than that, I want to see drawings and maquettes and whatnot of the world, the creatures and characters and all that jazz. Part of me wants it to be a movie. The visuals would be awesome. I love the movie Ever After! This sounds like a sweet story. After October, I'm going to concentrate on more fantasy that I've been neglecting. I also really like your point about not having to have a villain. Yes, in life there are setbacks, but not always any more than that. How did I miss this post before?! FAIL!! Also, I love the point about the villain. Something I don't think a lot of people think about, but really, it's far more true to life (not that mermaids and flying men are true to life but...) and I'm super excited to see how this one does it! Also, really interested to see HOW this is a companion to MUG, because faeries and mermaids... not really seeing the connection.